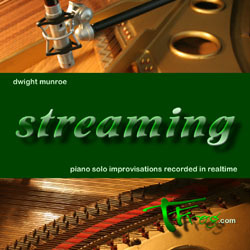 An introductory sampler of dwight's piano solo improvisations in a range of styles and colors. Listen to streaming now. MP3 Downloads — available at iTunes, Amazon, and wherever you buy music. Three online albums for your listening pleasure, plus bonus tracks. What a difference an "L" makes! All images and audio files throughout this site are ©TFrog.com. Email for permission to use.